You're right, the crank became more free as I loosened the crankcase bolts, to the point where I could spin it over by hand. How do I check crank etc? I do it like this, you can get it straight to within about a thou. If crankcase is distorted, that is more difficult, a long 5/8" reamer can sometimes sort it depends how bad it is. I have found a bent crank to be more common. Replacements are always on the bay https://www.ebay.co.uk/itm/BRITISH-SEAG ... SwcTRa14re "not this one as it for an early one, as pointed out by Charles"
Or speak to John, he will have them. You'll have to forgive my ignorance, but how do you get it straight in the lathe? I've got a Boxford but it's a bit buried at the back of the workshop! I've got a DTI too, somewhere safe!! Ricko wrote: You'll have to forgive my ignorance, but how do you get it straight in the lathe? 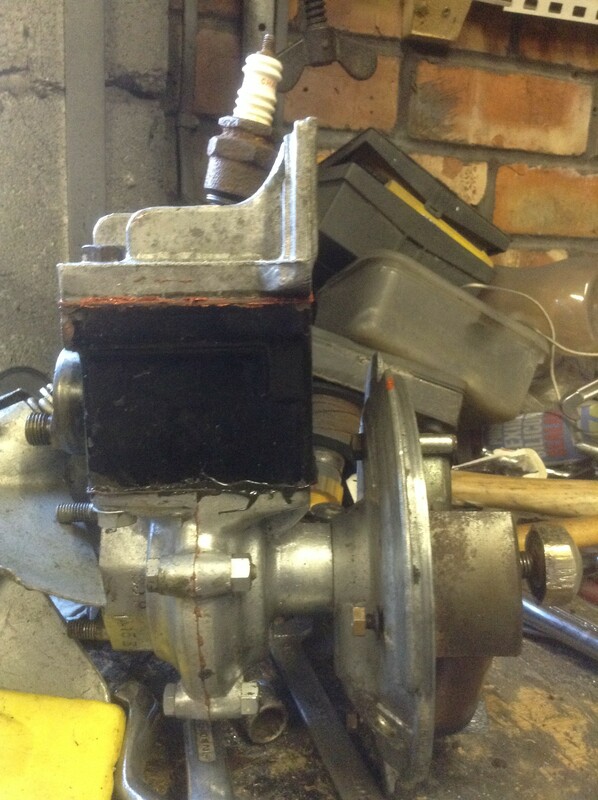 Make sure your chuck is true, luckily my 3 jaw is near spot on, if not pop it in a 4 jaw and centre it with dti. Then put the DTI on the flywheel end and see how far out it is. A couple of light donks with a wooden mallet will get it straight. If the crank is badly twisted chuck it in the bin. I have straightens quite a few of my own, plus a couple for other people, even trued up the needle roller crank in my race engine. Worth having a go before it end up in the scrap bin. 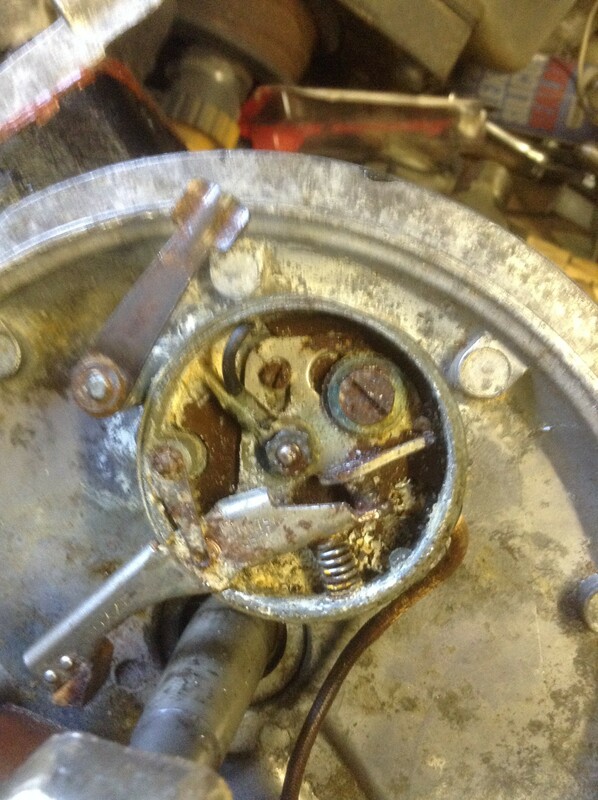 Split the crankcase to find the crank area had loads of sand in it!!! Cleaned everything in carefully in solvent and blew with the airline. Reassembled it and nipped up the crankcase bolts, fitted the the cylinder on without the rings, and it turns over by hand if I put the nut on the magneto end. I reckon it's worth a punt. However..., one of the rings was seized on and rather than leave it in diesel overnight I was carefully prising it...when of course it snapped! 1. There was no gasket on the crankcases, do I need one? 2. The cylinder base gasket is ok, refit with Hylomar Blue? 3. To anneal the head gasket, heat 'til cherry red and drop edge on into water? Ricko wrote: 1. There was no gasket on the crankcases, do I need one? No Gasket between crankcase halves, should be an air tight fit, can use a light smear of gasket goo. I use http://www.loctite.co.uk/loctite-4087.h ... 2653339649 as it is petrol proof, and good up to 350 C.
I anneal head gasket on the gas stove, stick it on the big ring until Cherry then chuck it in the washing up. John has ring, they are not that expensive. Rings received from John yesterday. Started the reassembly today, a thin smear of semi hardening Hylolite Red on the crankcases and a smear of black sticky Loctite on the base gasket. New rings installed and a satisfactory 'Thwop' noise as I turned it over without the head. Just need to anneal the head gasket in a bit then the head can go on. The Bakelite ignition connection at the magneto side is cracked, I might try a repair to see if I can get a spark, copious amounts of two part resin type glue? 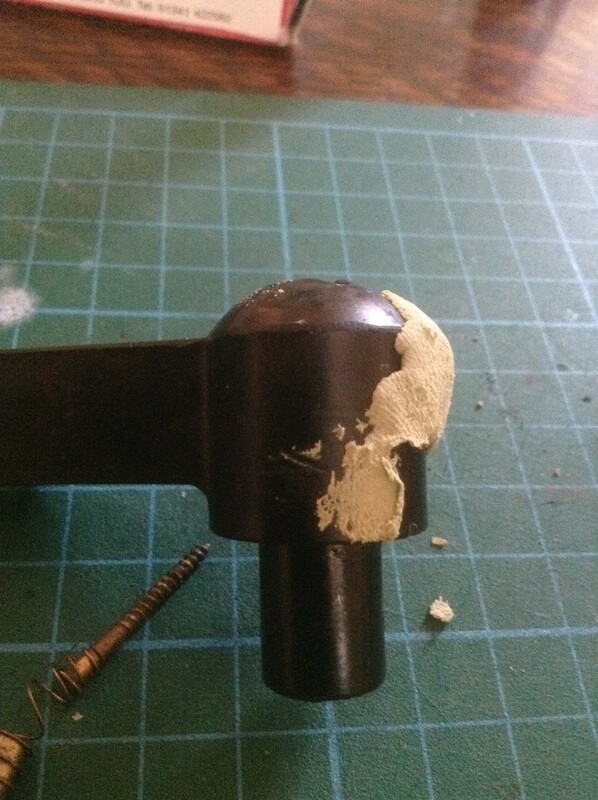 Ricko wrote: The Bakelite ignition connection at the magneto side is cracked, I might try a repair to see if I can get a spark, copious amounts of two part resin type glue? Glad you are making progress, epoxy should work on the HT pickup. Post an other picture to show how you are getting on. Repaired HT connector, I used some superglue to bond the Bakelite but there was also a piece missing so I moulded some Milliput to fill it. I've removed the cover off the points ready to tackle that area. Once I have cleaned it out do I refit the magneto without the cover to set the points at its widest point?? Have you tested the coil? They can break down when they get old. Measure the resistance between the wire that goes into the coil and the bit that connects to the HT lead, should be about 4K ohms. If it is open circuit you may get the odd spark but it won't run reliably. Also under the points box is a villiers condenser, worth replacing that as they give up when they get hot I have found. Cheapest place for a condenser I have found is ebay about 10 quid. Thanks for the heard up on the coil, I've just measured it at 3.48K ohms so that seems ok. I'll strip the points etc out and clean them, I'll try the old condenser first, I'm working towards pulling a rope on it tomorrow maybe. I can always strip back and replace it if the ign is no good. What should the points be set at? Ricko wrote: What should the points be set at? You may want to boil up your petrol tap cork, as good chance it will be dry and leaking. Looks like you were right about replacing the condenser!! What else should I be checking?? Should still spark across points if condenser is duff spin it over in the dark.I would be looking at the pickup, HT lead, points box. You can put end of plug on coil, ground plug body with wire, this to remove pickup, lead and cap from the equation . Points box has insulating washers, if these are missing spark will ground out, did you take the points box apart? My money is on the HT lead and pickup. I've dragged it out for another go, although the plug doesn't fit in the hole to make contact with the coil so I'll have to have a rummage for a different one. Despite the rebuild I've still got doubts about how hard it is to turn over, I had to get my son on the rope, we're both used to recoil starts on saws etc!! I didn't dismantle the points but just gave the area a blow with the air gun.